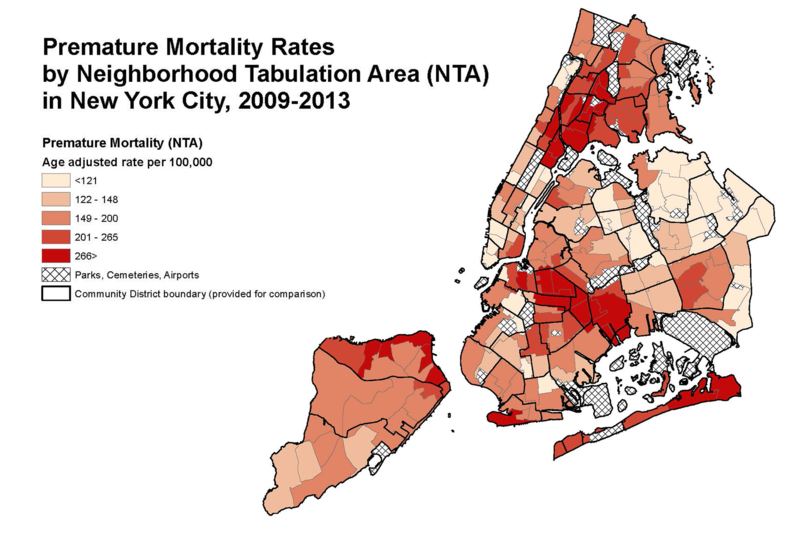 Source: NYC DOHMH Bureau of Vital Statistics; NYC Planning Population Estimates Adapted from the American Community Survey 2009-2013. In New York City (NYC), residents living just a few subway stops apart can face large gaps in life expectancy. It’s a big city made up of smaller, diverse neighborhoods—each facing unique health challenges. Currently, health data are presented in the Community Health Profiles by Community Districts, which contain approximately 140,000 residents. However, information at this level often masks pockets of residents that are burdened with high rates of disease. Furthermore, some datasets are not available at this level – including data from the city’s human service agencies. In order to empower city and community leaders to address persistent health inequities, they need access to geographically specific data on the multiple determinants that shape the health of their neighborhoods. Making this micro level data available can help stakeholders drill down deeper to identify the most salient health concerns and allocate resources to areas with the greatest health needs. To enable robust evaluation of the key drivers of health in NYC neighborhoods, the NYC Department of Health and Mental Hygiene (DOHMH) and its partners, including the New York Academy of Medicine, the United Hospital Fund, and the NYC Center for Innovation and Data Intelligence, are creating comprehensive small area health profiles of individual neighborhoods that reflect the potential impacts of social, economic, and other factors on community health. This project is a collaboration between the health department and several city human service agencies that have access to data related to multiple determinants of health including child services, aging, homelessness, and human resources administration. The NYC Center for Innovation through Data Intelligence (CIDI) plays a central role, acting as neutral convener that aims to support a culture of data sharing between city agencies—in this case, between the health department and human service agencies. CIDI harnesses relationships, obtains buy-in, and develops governance policies and procedures so that data from city agencies can be brought together in one central location. The DASH project has given the health department a more nuanced perspective of the varying levels of readiness for data sharing among other city agencies, and for some, publicly releasing their data will be a monumental step forward. To gain buy-in for the project, CIDI leadership, as well as one staff member jointly supported by CIDI and the health department, works with a team of data stewards from each agency to understand what indicators are most meaningful for them and how the data can be utilized to support their internal objectives. CIDI also created a formal process to help data stewards present the project to leadership at their respective agencies. Another entity that the project has engaged is the NYC Population Health Improvement Program (PHIP) Steering Committee, a regional health planning group with representatives from public health, health care, community development, and human services. The PHIP Steering Committee provides a neutral and transparent forum for reviewing and discussing population health issues and disseminating best practices. PHIP partners, in particular the New York Academy of Medicine (NYAM) and United Hospital Fund (UHF) of New York, and a workgroup consisting of data and policy experts, meet regularly to discuss project use cases and help select priority indicators so that the analyses generated can be translated into public health solutions. For example, NYAM may leverage NTA data to engage communities in adapting proven community-based approaches to chronic disease prevention and to advance healthy aging work, and UHF could use the data to facilitate promotion of health care delivery transformation in New York State. The project aims to provide a model that can be replicated by other regional planning groups in big cities that are aggregating datasets from multiple sectors for community-level analyses. The culture of data sharing in NYC will be strengthened as more individuals and organizations use NTA-level data to better understand their communities and expand their impact.